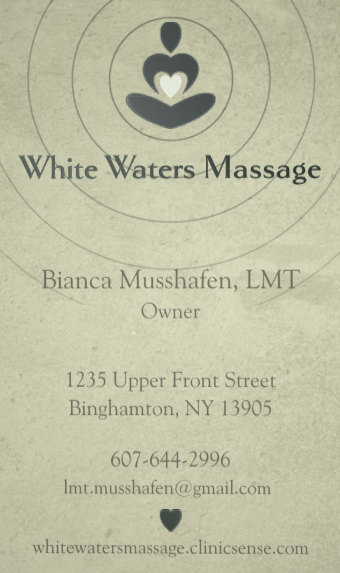 I attended the Finger Lakes School of Massage and graduated in July of 2012 and have been working as a therapist since. I specialize in Swedish massage, deep tissue techniques, connective tissue therapy (CTT) and communication skills. My sessions usually consist of a combination of all these modality approaches, based on client needs and preference. I like to address some patterns that people develop through habit and day-to-day life. I believe that easing stress, promoting wellness, and allowing freedom of movement makes life a lot better. In this hectic life, we have no time to take care of ourselves, hence massage is needed for rejuvenation and stress reduction!